It's been fairly simple for me to create passive programs for the children at my library. Scavenger hunts, coloring pages, animals to observe - these are all things children would enjoy doing at the library. It's a bit harder to figure out what can be done for teens, but I finally stumbled upon an activity that works for my teens (and any adults who might stumble upon it as well): book in a jar. 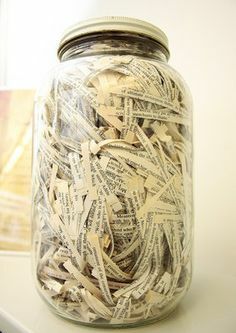 The concept is simple: find a weeded book (or purchase a Dover thrift edition if you'd prefer), shred the pages, stick them in a jar, and let the teens guess what book it is. When I shredded my book, I made sure to leave out any parts of pages that had the title listed on it - one of the books I chose had the title at the top of each page. I also tried to use mostly pages that were completely covered in text. Blank strips do not help at all for guessing! I tried using the office shredder to make my strips, but it turned the pages into mush, far too unreadable. Instead, I used our paper cutter and cut all the strips that way. I could cut 3-4 pages at a time, and this way I knew the strips actually had readable words on them. For books, I obviously can use books we weed due to condition, but I also try to choose fairly well-known or popular titles. For December, I used Charles Dickens's A Christmas Carol. For this month I have chosen Through the Looking Glass, which is also the book the teens are reading for their book club. I made sure to inform the desk staff of the answer, and I have left Hershey's kisses as a prize for those who guess correctly, but many will be intrigued by the mystery simply for the sake of guessing and may not care about any kind of prize. And even though I have not yet observed anyone actually using the book in a jar, I have been told that our patrons have been guessing and enjoying it, which was the whole point. What kinds of passive activities do you set out for teens?